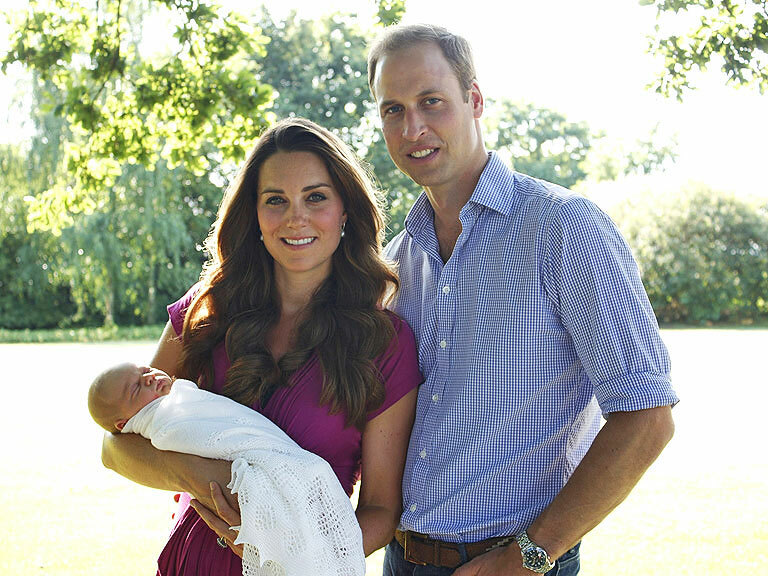 The day before yesterday, they royal fam released these pictures of the new little royal family. They were snapped by Kate's father in their backyard. How refreshing and regular does that sound? Of course, their backyard is surely a perfectly manicured English garden, but still. First off, kudos to Mr. Middleton for good photography. 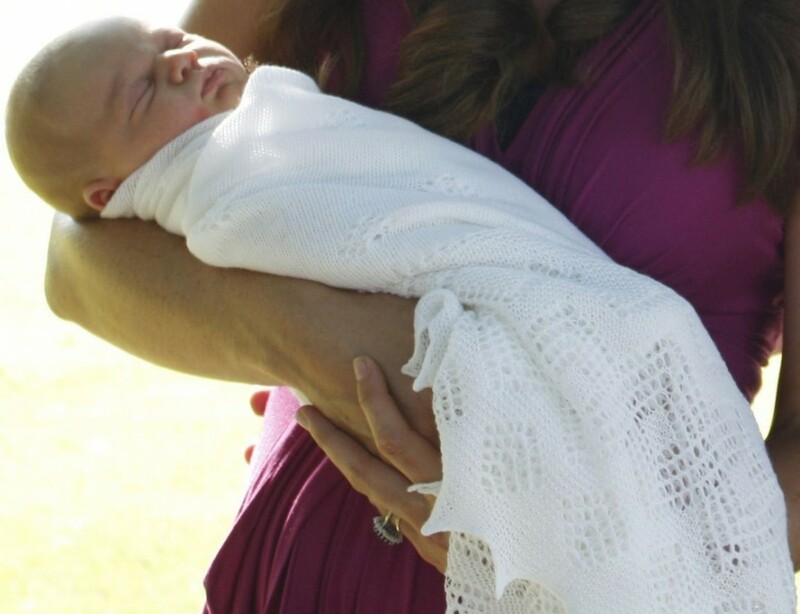 Apparently, the dress that Kate is wearing is actually one of her maternity dresses. It's a beautiful color on her. 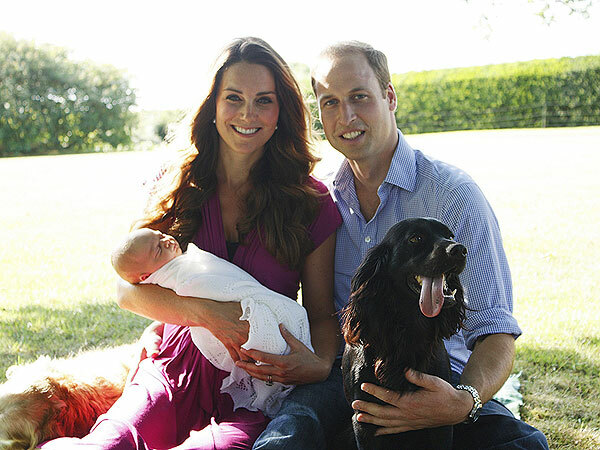 I love the picture of them sitting down with their dog Lupo (and another dog behind them?). Their smiles are a little bit bigger in that picture,and they seem a bit more relaxed. I remember that from our newborn session regarding Shelby. Pets create that little bit of chaos that forces you to be in the moment and just laugh. According to the People article here, the new parents did it on their own at first, but now are either already receiving help or are planning to. This makes sense to me. First off, they could have any amount of help that they wanted. Second, William will be returning to work soon. 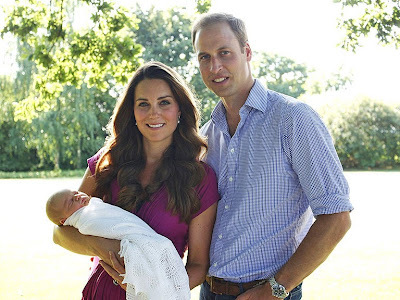 Third, I am sure that Kate will be resuming some of her duties soon as well. So it makes perfect sense to me that the would want to be by themselves (and with family) at the beginning, but now have some professional help as they make the transition back to their regular lives. I read somewhere that William confessed that he wouldn't mind returning to work. Haha. I secretly wondered about that when Dan returned to work, whether he was sort of relieved to get out of the house. I DREADED Dan's return to work, and I wonder if Kate feels the same way. I was worried about doing it on my own without his help. Plus, it's fun to be a little team. It ended up being just fine, of course. Something else to watch out for is all of the baby products that Georgie uses in the future. The Huffington Post article that I posted yesterday (here) talks about the "Kate effect." This happened with her fashion - she would wear something, and within minutes, it is sold out. Well now, this will apply to George's baby items. It has already happened with regards to those particular Aden + Anais swaddles. It is sort of exciting to have this high profile, classy couple going through first time parenthood around the same time as me and Dan. I can hear Dan rolling his eyes from my office as I write this. He thinks that all of the royal baby/royal family attention is SO ridiculous. Sorry, honey! I can't help it! They're just like us! They have a dog, WE have a dog! They have a new baby boy, WE have a new baby boy! Ummm....ok. I guess the similarities end there.